Chile Guajillo is a mild to medium hot dried chilli. 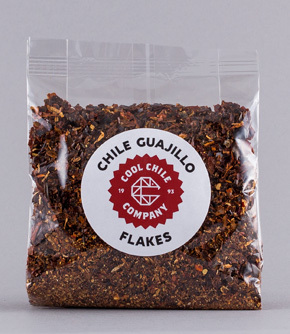 Our flakes are made from deseeded and diced whole guajillo chillies. Smooth-skinned guajillo chilli is one of the workhouse spices of Mexican cooking (along with the ancho chilli) and has a bright, tangy flavour that benefits from toasting. Sprinkle into simmering lentils to rehydrate and add a spicy kick and depth of flavour. Lightly toast guajillo chilli flakes in a dry pan until fragrant to release their flavour or add directly to simmering stews or soups. Guajillo (gwah-hee-yoh), meaning ‘little gourd’, refers to this chilli’s shape.